Editor’s Note: The current printed edition of Working RE is in the mail. 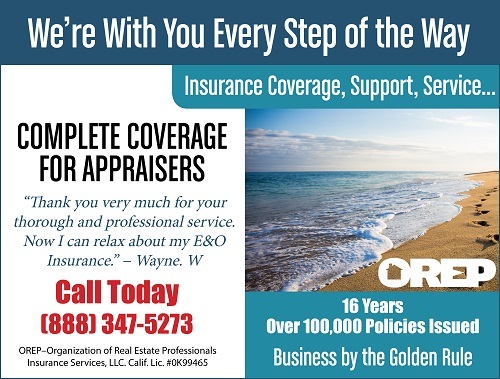 OREP Appraiser E&O insureds enjoy it free! Another phase of Fannie Mae’s Collateral Underwriter is scheduled to be implemented shortly. This will place additional pressures on appraisers to “get it right.” There still appears to be confusion on the part of many appraisers regarding several aspects of the appraisal analysis and reporting process. Let’s clear up the confusion. Confusion often exists when facts are hidden, explanations are fragmented, reasons are unknown, and examples are nonexistent. However “confusion” also exists when people’s habits are forced to change; especially when people disagree with the reason or goal of the change. For the most part, Fannie Mae Guidelines are not in conflict with USPAP. While USPAP allows appraisers wide latitude on how we appraise and report findings, Fannie Mae and Freddie Mac (the GSEs) are more demanding in how information is reported on their forms. If appraisers are creating reports that might be used by the GSEs, then supplying what the GSEs need is vital to the appraiser expecting to stay in business and obtain a Tier 1 rating along with the associated higher fees. Remember it’s their forms, their requirements and their world. If you choose not to fulfill this expectation, then expect to fail in this business segment. Remember the “Golden Rule”: He who has the gold, makes the rules. Metaphorically speaking, the GSEs are in charge of the gold, so appraisers need to live by their rules (and USPAP). Many of the issues we are seeing are related to appraisers not adapting to new requirements. I hear appraisers stating: “This new Q&C rating system is stupid and I disagree with it.” OK, you can disagree. However, we should all remember that Fannie Mae and Freddie Mac’s new Appraisal Quality Monitoring initiative (AQM), the Collateral Underwriter (CU), and the new Quality and Condition ratings are a response to a sytem they see as failed. And it’s not just the GSEs that are demanding higher quality work. Most properly run lenders are seeking out superior appraisers and creating new appraisal review systems; the GSE system is one among many. These new systems are designed to eliminate bad appraisers and improve the quality of future appraisals. This will benefit everyone by eliminating the form-fillers and increasing fees for the appraisers that survive the change. An “average” quality home built on stilts in the swamps of Louisiana is different from an “average” quality home constructed of concrete and steel in Santa Barbara. However, in the past, appraisers used the same term to describe both properties. This outdated protocol would classify the mega-expensive home of Bill Gates, which is located in an area of other mega-homes, as being just an “average” home because it was similar to other homes in the neighborhood. Well, if the house is common, typical, average, like many others, isn’t that how appraisers should classify the home? That’s nuts! No one who’s interested in buying the Gates’ mansion would classify that home as “average.” A classification of “average” would be misleading to readers of the appraisal and insulting to buyers and sellers of similar homes. It’s inappropriate for appraisers to use this description. In the past, appraisers would compare an “average” home and describe a superior home as “good” then make adjustments (Relative – How they relate to each other). The problem is the term “average” was misleading and confusing, and was the other home really superior or were appraisers merely indicating it was so they could make an adjustment? People on the street, reading our reports, wouldn’t understand the relative use of fair, average, or good – they would be confused. With the GSEs creation of six quality definitions, appraisers can evolve and determine which definition fits the subject and comparables best. Does the house fit Q2 definition or not? Yes or no. Which definition fits the comparable best: Q1, Q2 or Q3? I know many appraisers are shaking their heads and saying “Nooooo! This system doesn’t work!” And I say: take a deep breath, this is a new appraisal world; adapt and properly classify the houses. This is no longer a simple description on how they compare or relate to each other. Today the appraiser determines which fixed definition best describes the home. A) Does the market adjust for differences between the two homes? B) If buyers are adjusting, what is the adjustment? If there is a measurable difference in the marketplace, then make the adjustment on the grid and explain what is different between the two homes. It’s not rocket science but it is change, and appraisers must learn to adapt. Two different homes can have the same Q rating and still have market adjustments. Two different homes can have different Q ratings and there are no measurable market adjustments. Classifying is one thing, adjustments are another. Even though they are on the same line, they’re separate boxes. For lender/GSE work, Good, Average, and Fair are dead, long live the Q and C.
During training, many appraisers were given “adjustment sheets.” These sheets listed the theoretical adjustments that new appraisers were to use. These were “training wheels” designed to get appraisers started, they were never intended to replace analysis and facts. The problem is, many appraisers never “graduated” to using proper methodologies. Some are still using “rules of thumb” from an “adjustment sheet” handed down to them by their mentor. The figures on these scraps of paper cannot be applicable to both a farm home on twenty acres in Minnesota and a waterfront home on 5,000 sq. ft. lot in Florida. If appraisers are using these sheets, stop it! The use of these sheets is archaic. Reliance on a document like this is misleading and it indicates a lack of understanding and competency (Tier 1 vs Tier 2 appraiser). ther appraisers were inappropriately told to use their “opinion” of what an adjustment should be. This is equally inappropriate, outdated, and downright wrong. By law, adjustments must be based upon market data… facts, not opinions. In the past it was difficult for adjustments to be challenged by lenders and review appraisers. More than likely, they had less information than the original appraiser or didn’t have the time to determine the appropriately supported adjustment. As a result, adjustments were rarely challenged by lenders. In legal settings and state disciplinary actions, appraisal adjustments were challenged, but rarely for lending work. Many appraisers became form-fillers, tossing their opinions around as if they were fact. Those opinions and adjustments are not facts. And these new codes will be implemented shortly, by the GSEs: 621 (GLA), 623 (Condition), 624 (Quality), 625 (View), and 626 (Location). Each of the new codes will address adjustments in the wrong direction for a specific property attribute. Message Code 632 will address the absence of time adjustments for increasing or declining market conditions that appear to be warranted. There are more than 22 codes that apply to adjustments and the number of adjustments that the computer analyzes is growing. In this new world, appraisers must have support, proof, and evidence for every adjustment. There are more than twenty-five different methods that can be implemented to determine adjustments. Not every method works every time or in every market but, the appraiser must understand and use these different methods. Since the GSE computers use various algorithms and forms of linear regression, understanding these basic methods is vital. If appraisers don’t understand the various methods, get educated and do it fast! The appraiser’s job is to provide a service to their clients while complying with USPAP. Clients need information about the market along with understanding of the subject and its value, all conveyed in a manner that the client can use. Clients hire appraisers to provide the necessary information. Appraisals are not for the appraiser, they are for the purposes of the client. Stay tuned! I’m trying to keep you safe out there. Don’t Miss Hagar’s Upcoming Live Classes! By law, adjustments must be measured and supported based on the reactions of buyers and sellers within the market place. Failure to properly support adjustments can get you “gray or black listed” by lenders, Fannie Mae, and Freddie Mac. This course will provide both aspiring and experienced appraisers with the necessary tools to perform professional and proper appraisals. Not in California? Take the Course Online Here (7 Hrs). “I have recently completed the best appraisal class of my 30 year career (How to Support and Prove Your Adjustments through OREP.) ” -Susan D.
Avoid CU’s red flags, minimize callbacks, save time, and earn more! In this course, Hagar shows you many of the most common failures to appraisals flagged by the Collateral Underwriter, appraisal reviews, and in interviews with chief appraisers of AMCs and lenders. Gain a deeper understanding of the failures, and get solutions to help reduce the call-backs, hard stops and the need for corrections. Up your game, avoid time-consuming callbacks and earn approved CE today! Richard Hagar, SRA, is an educator, author and owner of a busy appraisal office in the state of Washington. Hagar now offers his legendary adjustments course for CE credit in over 40 states through OREPEducation.org. The new 7-hour online CE course How to Support and Prove Your Adjustments shows appraisers proven methods for supporting adjustments. Learn how to improve the quality of your reports and defend your adjustments! OREP insureds save on this approved coursework. Sign up today at www.OREPEducation.org. You people don’t get it!! The URAR is really an algorithm. FNMA, FHA, VA and USPAP are the rules you agreed to play by. Most of you don’t. Try reading the rules, carefully. The bad news: Here is where you go wrong. The good news: the people reviewing your work don’t get it, either. If they actually do appraisals and reports, they do not understand the requirements. The worse news: The licensing agencies don’t even have a clue. They make up their own rules as the go along. If they actually stuck to a written USPAP rule and tagged the appraiser with it, that would be OK. They work on opinion and innuendo. Read USPAP carefully. Look at each rule and look at your report. Change the wording to expressly meet USPAP. Make a model and use it. Its all an algorithm. SR2-2(a)(viii) applies to all of the appraiser’s 1004 assignments. This means that the appraiser needs to recognize that there are only two types of blanks to be filled in on the URAR: Fact or Opinion. If a fact is inserted, the work file needs to have that data in it or a reference to where it is located. Easy, peasy if your report makes the reference. You have a USPAP violation if it does not. If an opinion is rendered, the information analyzed, the appraisal methods and techniques employed and the reasoning that supports the analyses, all opinions and conclusions must be summarized in the report. Most reports do not have this in it. This is because the appraiser usually is in a rush to get the money. If that is the case, then fraud has occurred. Fraud is when a material representation intended to induce reliance to benefit the appraiser and harm the borrower / lender / AMC has occurred. The appraiser has made a short cut for either the money or because the appraiser did not understand how to do the work. The appraiser has not done what the appraiser is supposed to have done but ‘certifies’ that the appraiser has. Strangely enough, it is fairly easy to make a model that addresses all of the necessary points. SR 1-1(a) says that the appraiser must be aware of, understand and properly employ those recognized methods and techniques that are necessary to produce a credible appraisal. Have you ever read any books that describe the recognized methods? Can you cite them? Did you use one or more to develop your adjustments? Fannie Mae says that the appraiser’s adjustments [+$, -$ or $0] must reflect the market’s reaction to the difference in properties. Whether the appraiser inserts a $ amount or $0 in the URAR grid, a test must be made when the feature’s quantities / qualities differ from the subject because there is now an opinion or conclusion. Do you know the tests? Reasoning must be in the report. The appraiser is not supposed to blow it off for a quick buck. The appraiser that does is killing himself, other appraisers and the fee schedule. Do you know the definition of Reasoning? Does your report have reasoning for each and every opinion / conclusion? Disclaimer: I am not a member, affiliate or any part of the Appraisal Institute but I take SR 1-1 (a) and the Appraisal Institute’s books seriously. Most appraisers will agree that they use the Sales Comparison – Paired Data Set method / technique to develop their adjustments. Rarely are other methods or techniques used, but they could be. If you are using the Sales Comparison – Paired Data Set method / technique to develop you adjustments, consider the following. The Appraisal Institute’s books ‘Using Residential Report Forms’ and ‘Valuation by Comparison: Residential Analysis and Logic’ state that the logic of paired data analysis will result in nearly identical values for the Adjusted Sale Price of Comparables at the bottom of the URAR p2 grid. This is what forms the basis for a ‘most probable price’. It is statistics as opposed to the appraiser’s reliance on a ‘price of a comp’ that only has the least adjustment. The comp with the least adjustment means nothing if the appraiser has not made all of the adjustments necessary to have a narrow Adjusted Sale Price of Comparables which is the basis for a ‘most probable price’. Read the books. What they are telling you is 1) Each time there is a difference between the subject and any of the Comps, have a ‘test’ to determine if there is a market reaction and what that market rection is, if any. 2) know what method / technique you are using to develop your adjustments. 3) Summarize the reasoning that supports the opinion / conclusion. 4) Form a narrow Adjusted Sale Price of Comparables by having your adjustments reflect the market’s reaction, if any. 5) With a narrow range of the Adjusted Sale Price of of Comparables, you will have a [statistically] Most Probable Price Which a Property Should Bring [Market Value definition]. Don’t fall into the trap of having a wide range of values in the Adjusted Sale Price of Comparables. When you ‘select’ a comp as being the ‘best’ indicator of value and there is not a narrow range, all it means is that you did not adjust properly and reflect the market’s reaction to the difference in the properties. If an appraiser thinks that appraising is easy money, try learning how to do it right. Its your signature, your license, your E&O they want and need. 1. FNMA invented the concept that real estate comparisons are not relative, and must be absolute. It doesn’t work that way in the real world and it undermines a fundamental concept of real estate appraisal. We get that this idiocy is a client requirement, but stop pretending it is some kind of universally accepted standard of professional appraisal practice. It is not. 2. It was FNMA that lied claiming their UAD system would ‘clarify’ reports and make them easier to understand. Though in this case, I’d agree. They give a print out that requires very little opinion on our part. Condition and quality are separate (though superior quality may often lead to better COMPARATIVE condition). 3. The “error” codes are misleading and should be stopped immediately. FNMA has no valid ‘model’ None. They built the database on a flawed concept (that which included false, artificial percentile adjustment guidelines. Guidelines that we still see AMCs and lender reciting! When FNMA retired those phony guidelines, they did a poor job communicating it (Yes, I read LL2/14/2015) if I’ve not misstated the date. 4. TAF (Roberta Oullette) attorney has given presentations that suggest perfection rather than credibility is the new metric. That ‘opinions are “often” based on no knowledge, & where facts such as data ‘science’ are magically perfect. Richard, I’ve taken your classes and concur that IF I want to do work for FNMA, then I have to play their game. The truth of the matter is that I’m far busier and happier doing real appraisals for clients that know what an appraisal is and that do not seek to micromanage every aspect of it…very poorly. I’ll still do FHA and may consider VA, but frankly, FNMA coupled with TAF hypocritical direction to regulators has simply made doing work for FNMA more trouble than it is worth. Shortly, they will have a real shortage to deal with, as more and more appraisers realize we don’t have to put up with their capricious silliness any longer. For those NOT dumping FNMA, I definitely urge taking your courses. The appraisal process should not be this technical. Appraisal is an art not a science. If appraisers would just explain / reconcile the opinion of market value that is good enough, no quantitative adjustments. Its an Opinion not a hard fact. Just go the the Hybrid model and provide a range within 10% and let the lender make the call rather than have an appraiser try to support a $2000 bath adjustment on a 5 acre wooded parcel overlooking the lake. We just need the GSE & taxpayers out of the lending business or raise the appraisers E & O to 15,000,000. This is not really that hard. the biggest and best. This past weekend my city was supposed to get 10 inches of snow. We got two. They blamed it on the wind. Candy, I think many of the things we are required to do come from those with a license but who no longer appraise. If I were king most appraiser’s rules would come from appraisers who still actively appraise and the remaining rules from regulators(with appraiser input). On the one hand a stunning amount of flawless content is required for every appraisal if it is to be credible. On the other hand the feds and lenders are now saying even perfect appraisals aren’t required at all. They will just run an avm or some hybrid guesstimate. What could go wrong?